Egg Cell (Human ovum) under a microscope! FACTS: The egg cell, or ovum, is the largest and most important cell in the world – and it’s only found in women! Although men produce over a million sperm an hour, women are born with a lifetime trove of several million eggs. By adulthood, only about 400,000 remain, and over the course of life, most of the rest – nearly 1,000 a month – are lost. In fact, only about 450 of the millions of egg cells will ever get even a chance to become a baby. Every day of a woman’s fertile life, several dozen eggs begin developing. Normally, only one will complete the development cycle every month – the rest perish. But the mature egg gets to leave the ovary and take a daring journey down a fallopian tube where it has the chance of encountering eligible sperm. 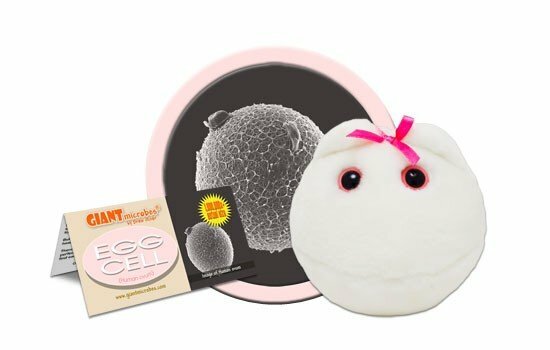 Like a princess in a fairytale, an egg cell has only about a single day to survive before finding a mate – though because sperm cells can survive for up to 5 days inside a woman’s body, a woman can be fertile for nearly a week. But egg cells are monogamous: after one sperm has gotten into its heart, the egg hardens its outer wall to ward off any additional suitors. There are many obstacles – and fierce competition – to becoming the perfect couple. But if all goes well, and the sperm and egg manage to find each other, it can lead to a miracle and a match made in heaven. The egg cell, or ovum, is the female reproductive cell. 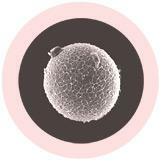 Unlike the sperm, the egg cell is large. It contains cytoplasm and unwound DNA, which promotes internal movement and flow. When the sperm and egg meet, they make a zygote that will grow and divide to become a full person. This is a cute gift for health teachers, gynecologists, or expecting parents. Ovum comes from the Latin: Ovum=egg. About 0.15mm, which is 1.5 times the thickness of a sheet of paper. 1827- Karl Ernst von Baer discovered the mammalian ovum. Limited: Women are born with a finite number of eggs and they do not produce more throughout life. Big: The egg cell is the largest cell in the human body.